“To me, become a mask dancer is not just a one time performance, but it is a lifetime lesson”. That is how Gusti Ngurah Anom Mardika explains about his enthusiasm about mask dance. Born and lives in Gianyar regency, Anom (that how he prefers to be addressed) has some stories to be shared with us. Mask dance is one of the old dance performances in Bali. 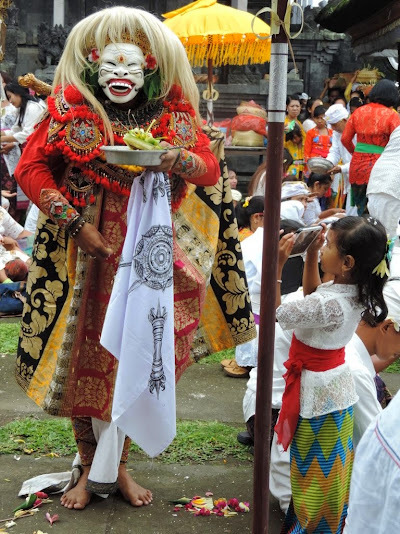 There are several Balinese dances utilizing mask and Anom he performs those normally performed during the religious ceremony. This is one of the hardest one since not only performing a body movement, but also requiring deep knowledge about culture and religious value of Balinese. Stephen took off his shoes when we arrived there. The trekking was not even started. "I want to feel the softness of this land " he said. Then rest of the people followed what he had done. After that funny part, the trekking began. Tanah Lot Temple is really one of a kind. Located in Tabanan Regency, this temple was built on a rocky beach. When the tide is high, Tanah Lot Temple looks like floating on the sea. It gives a very beautiful and unique view. The view Tanah Lot temple has been favorite of many tourists to spend the last few hours of the day. Yes, Tanah Lot Temple has a magic sunset view. An ideal place to spend the last few hours of the day before go back to their accommodation. Beside the Priest who in charge to lead the ceremony, there is one more important person that is in charge to prepare all offering on the ceremony. That person is called the Tapini. Tapini is always a lady that has strong knowledge about the offering including the very complicated one. Although a Tapini possibly never attend a management school but she has the ability to perform a modern management values to make sure the ceremony is smoothly prepared. She is planning, organizing, actuating and controlling the ceremony. Off course she does not work alone, there are many other people involve but she is the one of the most important one. There are many uniqueness can be found in Bali. Some of them even really cannot be found anywhere else in the world. Once in a year, Balinese celebrate silent day that is called Nyepi. Nyepi means silent. On that day Bali is literally silent. People stay at home so that no vehicle on the road, and no electricity. This is the day that the island is refreshed since no pollution at all from fueled engine.